We are here! Wow, what a ride here, what a place to end up. I am so lucky and blessed to be doing the things I am doing. I hope, and truly believe, that what we are doing up here in space will eventually help all of humanity through exploration, innovation, education and to kindle the spirit of curiosity we all have to find out/figure out things we don’t know. Although this is my second time living up in space, it is totally different this time. Not only is the station bigger, and there are more people, the activities are different – science is king, logistics are totally different with visiting vehicles, the core systems of the “laboratory” are built and stable, allowing us to live and work with a little more regularity. Some things remain the same – cleaning up, cleaning and working on the toilet, planning for trash, taking out the trash, restocking the “shelves”, computer maintenance – but these are things that are common to any business or organization. We are a “jack of all trades”, which is sort of nice. Keeps us busy! A big ALOHA to Kiha and all our friends there! We were lucky to fly directly overhead and then later off to the side (Earth is turning…). Also had a great pass over Europe starting with England, France, Italy, southern Greece, Crete, and Cairo, down the Suez Canal to the Red Sea, Somalia and southward. It’s a clear day today except the sand storm coming off of the African coast. It looked like a bulldozing of sand flowing over the Arabian Sea. It’s Sunday night on the ISS, HTV is coming toward us, we just released 47 Progress –it’s getting to be a traffic jam in space! Tonight we let go of Progress 47, so we had to work late on Friday to get it closed up and ready to leave. It will come back in 2 days…I will write about that in the blog post, but it is a test of a new KURS proximity system. BASS – burn experiments in the microgravity glove box – checking out how combustion and fire work with different materials in space. Pretty intense photo documentation, which is done in conjunction with the investigator in Cleveland, Ohio. 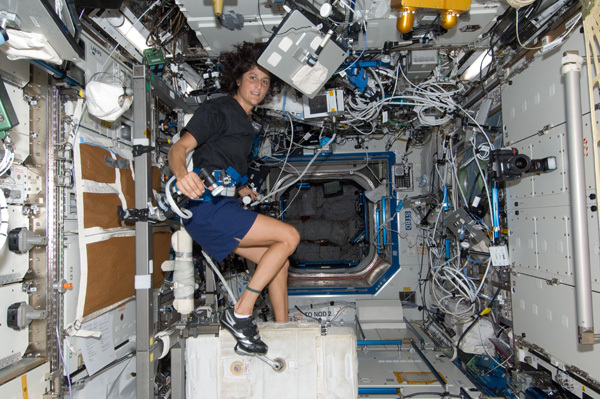 Reversible Figures – ESA experiment on how one perceives shapes and motions in space while floating. I looked sort of funny with a 3D looking headset on floating in the Columbus module with a mouse…but it is pretty neat. It is like the picture of the pretty lady and the old lady in one – depends how and what your brain picks up on. Reaction Self Test – done pretty soon after we get here to check our reaction times. WINSCAT – another reaction type test. But this one is to see differences in motor skills, perception, reaction time in case we bump our heads. Gives us a good idea if we are functioning okay. Integrated Cardio Vascular – intense monitoring of our cardio vascular system with Holter monitor and Cardio Press – you can see it on the CEVIS photo. I was wired!!! General moving in. We had to find our clothes, get our computers started up with email, etc., and, there is a new toilet! It is similar to the Russian one that is still here, but has that added feature of turning urine into water (urine recycling). It is great! Surely better than the Soyuz toilet in which it is best to moderate your “flow” – suction on that vehicle is a little less than here. It is simply amazing how much fluid you (well, maybe just me) lose right away. We simply don’t need it, so I evacuated my liquids for a couple days. I think I am evened out now. You can also see the fluid shift in people’s faces. We get rounder and rounded for a while until we are all evened out. The sleep stations are pretty cool too. Four of us sleep in Node 2, all adjacent to each other – remember you can use the floor and the ceiling too. I am on the floor – it is sort of like a coffin. Two sleep in the Russian segment sleep stations. We are just starting out getting used to everything again. It is amazing how much your muscles change in just a couple days. I knew this so I quickly jumped on the treadmill, T2 a.k.a. COLBERT on the second day I was here. Wow that felt funny, even my feet felt funny. The lifting machine, ARED, is awesome. I got warmed up on it on the third day and did a full lifting session today. It is just like working out at the gym at home. It is right below the cupola and we have a laptop with music on it nearby. I got up early this morning, cranked the tunes, looked out the window and had a great lift. CEVIS, or the bike, is the same one from when I was here last time. It is an old reliable friend. I got on it yesterday and a little today to go thru the exercise test and see how my leg strength is. Not too bad for an old lady – I made it through the protocols without too much effort. Biking is the weakest part of my triathlon, so I think I will work on it when I am here. I was wearing ICV (integrated cardio vascular) equipment that we will download this week for the investigators to look at. I have a Holter monitor on as well as cardio press on my left hand. I think my heart is in pretty good condition – at least that is what one of the Russian managers said during our welcome to the ISS (very interesting comment and I was told about it by a couple different people – I guess I was pretty calm during the launch). Space Food is good in space! Eating it on the ground is torture since there are so many good things to eat at home, but here, it is great. I just ate standard menu things. I’ve been hungry and I have been eating like a horse! The cupola is awesome. I was hanging out in there yesterday evening and I felt like I was in 20,000 Leagues under the Sea with the sea of stars and the glow of the earth below. Remember how Capt. Neemo had great windows in the movie? That is what it felt like. 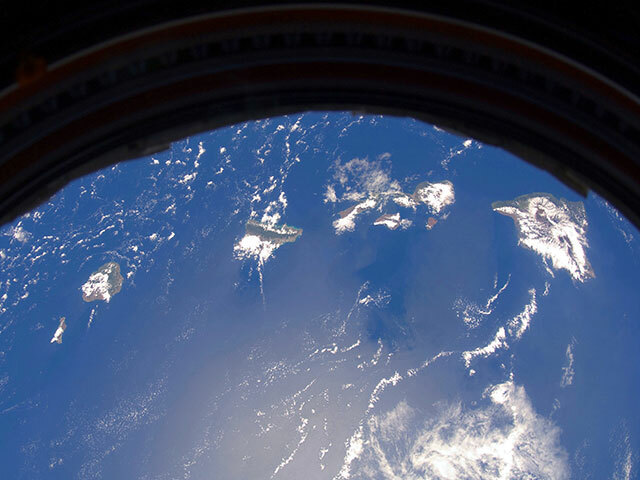 I had been there in the day and I kept looking around at the bottom of the ISS, because it is really cool too, but at night you can’t help but look out! What an awesome set of windows. Earlier in the week Joe pointed out the Southern Lights. I had seen a lot of “flashes” before going to sleep on the Soyuz and since I have been here. No wonder – there was some solar activity just recently and that made the flashes and the intense Southern lights. Pretty cool to see. To me they seem a little more flowing than last time when I saw Northern Lights. I remember Northern Lights as more active and intense, the Southern Lights seemed to flow. Working a lot, you forget where you are…Friday was a full day and I sort of didn’t even remember we were in space, just getting stuff done, one thing after another. Having a real weekend has been nice. It reminds me of where I am and what we are doing – not just going to work without a commute. This is real space stuff and it is cool!